9: 45 a.m. – 2:00 p.m. 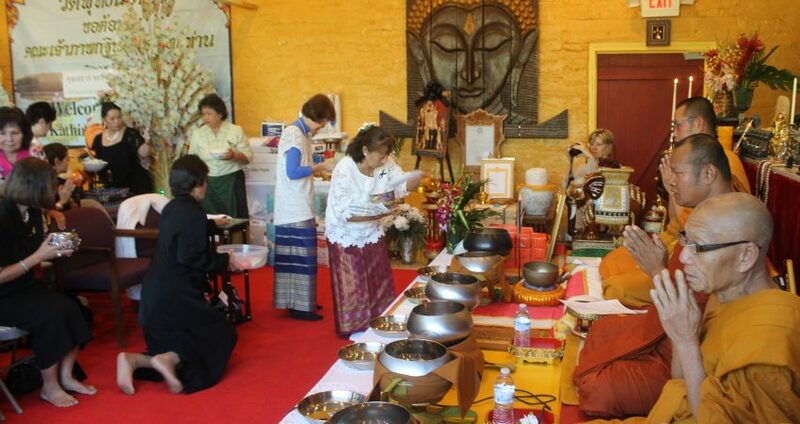 Since establishing “Wat Buddhametta: Tucson Buddhist Meditation Center” in 2010, the monastery and center has been serving the Tucson community. People come here to find Buddhism and other services for their physical and mental health. This year, we will host a special celebration for our seventh-year anniversary of the establishment of Wat Buddhametta. Please bring your family and friends. The celebration is free and all are welcome. Our special celebrations always include the giving of alms and the serving of lunch to the monks and nuns. This is followed by lunch for all who attend. For the alms offering, you may bring food (rice, fruit, or snacks) for the monks' alms bowls. For lunch, you may bring a prepared dish to share. After lunch, our abbot will give a talk explaining the meaning of the day's celebration followed by a blessing. The celebration will conclude at 2:00 p.m. The monastery is solely dependent upon your generous donations. If you would like to help with financial donations, please do so whenever you are inspired. Please note that all donations are tax deductible as we are a 501(c)3, a charitable, non-profit organization. 10.30 a.m. Paying homage to the Triple Gem & the Five Precepts Observing ceremony. 11.00 a.m.	Offering of alms for the monks (Tak baad) followed by lunch served to the Sangha. 12:00 noon	Lunch served to the Congregation.